the patient for payment. If patients are willing to pay for the service, then it is more likely that the service would be made available. Several studies in the literature have investigated patient willingness to pay (WTP) for pharmacy services. Willingness to pay is a pharmacoeconomic method utilized to understand what value patients place on health care, as well as a method to capture their preferences. Gore and Madhavan12 investigated patient WTP for pharmacist counseling of non-prescription medications. They found that consumers’ perceptions of pharmacists, as well as the number of favorable past experiences with pharmacists, positively influenced their WTP. Reutzel and Furmaga13 determined that a patient’s health status and income influenced their WTP for pharmacist outpatient clinics. Einarson, et al.14 assessed consumer WTP and attitudes towards a community pharmacy’s cholesterol and potassium blood level service. After providing the service, pharmacists found that, overall, patients had positive attitudes and were willing to pay for the service in the future. A recent study by Suh15 found that patient WTP for avoiding medication-related problems was influenced by age, health status, and perceived risk reduction. Barner16 investigated a host of variables related to patient WTP for an asthma self-management program. Patients who were likely to pay more for a program that would help them manage their asthma exhibited suboptimal behaviors during asthma attacks, had greater perceived access to health care resources, received less education from health care providers, had previously participated in a self-management program, and had indicated an interest in participating in a selfmanagement program. In another study by Barner,17 patient WTP for pharmacist provided diabetes disease state management (DSM) was assessed. Patients who were likely to pay more for a diabetes DSM had a greater perceived need for the service, had more emergency room visits, were more likely to be male, were more likely to be younger, and had higher incomes. Another study18 assessed WTP after study participants received herbal product counseling. Participants who had previous experience with counseling services were more willing to pay when compared to those who had no previous counseling experience. Several studies have found that at least 50 percent of respondents were willing to pay some dollar amount for pharmacy services.15-19 This indicates that there is patient demand for pharmaceutical care and DSM services. As shown in the brief literature review, there are a host of factors that influence WTP. 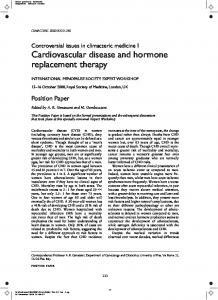 To date, there have not been any studies in the literature that have assessed WTP for HRT and menopause counseling. This study will explore these issues using a sample of menopausal women who patronize independent pharmacies. Study Design To accomplish the goals of this study, a non-experimental cross-sectional study design will be employed. A convenience sample (n=500) of women taking HRT and who are patrons of independent pharmacies will complete an anonymous self-administered survey. Institutional review board approval will be obtained prior to the start of the study. Specific details of the study follow. Sample Fifty pharmacists who are members of PCCA (Professional Compounding Centers of America, Inc.) and who are independent owners will be selected to participate in this study. Each pharmacist will be asked to select ten patients for study inclusion based on the following criteria: 1) patient must be on hormone replacement therapy (HRT) prescribed by a physician; and 2) patient must get HRT prescriptions filled at the pharmacy where the survey will be administered. The expected sample for this study is 500 (50 pharmacists with 10 patients each). The majority (>95%) of pharmacists who are members of PCCA are independent pharmacists. The student co-investigator for this proposal, Andrea Branvold, is also a consultant for PCCA and she has already received commitment from over 25 pharmacists, many of whom are interested in providing HRT and menopause counseling. Thus, it is expected that the pharmacists will be very involved in the data collection effort. also be asked to indicate the type of HRT they are currently on, as well as their satisfaction level with their therapy. Five-point Likert-type scales will be utilized to measure: frequency (1=never, 2=sometimes, 3=half of the time, 4=often, and 5=always); severity (1=not severe, 2=slightly severe, 3=moderately severe, 4=very severe, 5=extremely severe); and importance (1=not important, 2=slightly important, 3=moderately important, 4=very important, 5=extremely important). Information Sources and Satisfaction with Physician Services Women may turn to a variety of resources to find information on HRT and menopause. Participants will be given a list of resources and asked to rate how often they have used them. In addition, they will be asked to rate their level of agreement with a series of statements regarding their satisfaction with services received from their physician. The following five-point Likert-type scale will be utilized: 1=strongly disagree, 2=disagree, 3=not sure, 4=agree, and 5=strongly agree. Willingness to Pay for Pharmacist Consultations This section of the survey describes the components of pharmacist provided HRT and menopause consultations in terms of what services will be provided to them and what the expected outcomes will be. Patients will be asked a series of questions regarding the likelihood of them utilizing specific services, as well as their perceptions regarding pharmacists providing these services. The following five-point Likerttype scales will be utilized: likelihood of using services (1=not likely, 2=slightly likely, 3=not sure, 4=very likely, 5=extremely likely); and perceptions regarding pharmacists (1=strongly disagree, 2=disagree, 3=not sure, 4=agree, and 5=strongly agree). Patients will be given a range of willingness to pay amounts and asked to indicate their maximum willingness to pay for such a DSM program. Demographics The following sociodemographic information will be collected: age, race, income, and education. Participants will also be asked the frequency with which they have prescriptions filled in their pharmacy. approximately three months. Note: Because it has been shown that data collection wanes during the holiday season (mid-November to mid-January), five months have been allotted in the budget for data collection. Data analysis The data will be coded to keep track of participant responses and information. Statistical Analysis System (SAS) packages will be used for data analysis. An a priori significance level of 0.05 will be used. Frequency and mean summary statistics will be run for all variables. To test reliability, Cronbach’s alphas will be calculated for the physician satisfaction scale and the patients’ perceptions of pharmacists scale. To assess the impact of selected variables (i.e., symptom severity, information resources, satisfaction with physician services, patients’ perceptions of pharmacists, and demographics) on willingness to pay, regression analyses will be performed. SIGNIFICANCE The focus of this project is to assess patient WTP for HRT and menopause counseling among a sample of women who are patrons of independent pharmacies. Upon completion of this project, it is expected that information on the following will be obtained: patient WTP for pharmacist provided HRT and menopause consultations; patients’ perceptions regarding pharmacists providing HRT and menopause consultations and their likelihood of using the services; patient symptoms and severity of menopause; HRT and menopause information sources used by patients; and patient satisfaction with physician HRT and menopause services. In addition, the study will also reveal if any of the above factors were influential in patients’ WTP. The results of this project may be useful to pharmacists, patients, and health care payers. Pharmacists will be able to determine the need for HRT and menopause consultations, as well as the level of payment for the services. This study will also provide information on specific variables that may influence patients’ WTP amounts. This will help pharmacists target specific individuals and tailor programs to meet their needs. This study may encourage and increase the development of such programs, which could result in better patient management of their disease state. Services that result in better patient outcomes (e.g., decrease or elimination of symptoms) would not only benefit the patient, but it would also provide a positive reflection on pharmacy. In addition, positive changes in health care outcomes as a result of pharmacists’ interventions would be beneficial to providers and payers as well. Providers may be more willing to refer patients to pharmacists, and payers may be more willing to compensate pharmacists for their services. The results of this study may provide supporting evidence to third party payers that patients need and are willing to pay for these services. Budget Explanation (see Appendix A) Personnel The University of Texas requires a fringe benefit rate of 24% for faculty and staff. As stipulated by NCPA, no overhead costs will be charged. Jamie C.Barner, Ph.D., R.Ph. is Assistant Professor in the Pharmacy Administration Division. She will be responsible for overseeing all aspects of the project including planning the project, developing surveys, data collection, and preparing the final report. Dr. Barner will contribute 10% effort on this project. Dr. Barner will contribute part of her time in-kind. As shown in the CV, Dr. Barner has published 4 willingness to pay studies. Andrea Branvold, B.S., R.Ph. is a Master’s graduate student in the Pharmacy Administration Division. This project is in fulfillment of her Master’s thesis requirements. Ms. Branvold is also a consultant for PCCA. She will be responsible for recruiting pharmacists, developing the survey instrument, collecting data, entering data, and report writing. She will contribute 25% effort on this project. We are requesting a $1000 scholarship for her efforts. Supplies Paper and printing costs are included for the patient questionnaires (N=500), including pretest, initial questionnaires, and any follow-up correspondence. Based on estimates from the University’s printing services, it is estimated that printing for each survey booklet will cost $2.50, and postage for the return will cost $1 per booklet. Other miscellaneous supplies include pens, folders, computer disks, and other necessary project supplies. It is expected that telephone calls to participating pharmacists across the country will be made during the initial phase of the project, as well as during follow-up. As indicated in Appendix A, part of the project expenses will be donated in-kind. Report "Patient Willingness to Pay for Pharmacist Provided Menopause and Hormone Replacement Therapy Consultations"